Calls For A Change to Antique Gun Laws. A Video. I was told many years ago by the police that in order to defend myself with a gun, I must already have been shot. This meant that (a) I was defending myself against an aggressor using a gun, and (b) he had already fired at me and hit me. Their reasoning was that I needed proof that my life was in danger, and that I had no alternative but to use a gun in my defense. I was about 30 years of age then, so my age may have had some bearing in a self-defense issue. I am no longer a young man, and it seems this does carry some weight when defending yourself in court regarding the shooting of a person in self-defense. I here enclose information on the legality of self-defense in NSW Australia. In any assault type offence you can raise self defence as an issue in your case. If the court accepts that you were acting in self defence, the court will dismiss the charge against you. If you are going to defend a case relying on self defence you need to know the law relating to self defence. The self defence laws in NSW are found in Part 11 Division 3 of the Crimes Act 1900. Section 418 of the Crimes Act 1900 outlines when self defence is available. (1) A person is not criminally responsible for an offence if the person carries out the conduct constituting the offence in self-defence. An accused only needs to raise self defence as an issue in their case. The prosecution then has to prove that the accused was not acting in self defence beyond a reasonable doubt. · That what the accused did was not a reasonable response to the danger, as he or she perceived it to be. The information contained below involves complex legal principles. If you do not have a good knowledge of the law you may have difficulty understanding the principles. If you need assistance, please call or email us. The deceased was shot by the accused three times to the torso at a Hotel in Liverpool. There was no issue that the accused committed the act which caused the death of the deceased. The prosecution conceded that there was a real possibility that when the accused shot the deceased he was acting in his own self defence. There are two questions to be answered by the Court when self defence is raised. · If there is, is there also a reasonable possibility that what the accused did was a reasonable response to the circumstances as he or she perceived them. The first question is determined by a completely subjective point of view considering the personal characteristics of the accused at the time they carried out the conduct. The second question is determined by an entirely objective assessment of the proportionality of the accused’s response to the situation the accused subjectively believed they faced. The accused need not have reasonable grounds for their belief that it was necessary to act in the way they did in order to defend themselves as the common law required. It is sufficient if the accused genuinely holds that belief. The jury is not assessing the response of the reasonable person but the response of the accused. In making that assessment it is obvious than some of the personal attributes of the accused will be relevant just as will be some of the surrounding physical circumstances in which the accused acted. So matters such as the age of the accused, his or her gender, or the state of his or her health may be regarded by the jury. One matter that must be irrelevant to an assessment of the reasonableness of the accused's response (second question) is his or her state of sobriety. Australian Firearms Legislation & our Rights as Law Abiding Citizens. 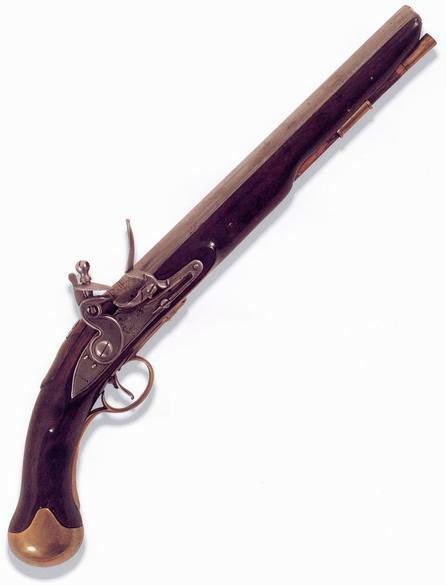 Just think about this, let us just for a minute pretend that the only guns we were allowed to use in Australia were flintlock muzzle-loading guns. Bear in mind that right now, this government groups muzzle-loading guns in with breach-loading guns, same registrations requirements, same licence requirements. Did you know that the special advisory committee for firearms legislation does not exist? That's right, they let us believe that they were taking advice from experts. I wrote to the powers that be, and I said, how come you have a special advisory committee and yet you make the mistake of classing muzzle-loading guns along with breach-loading guns? how come a pre-1900ad flintlock muzzle-loading gun does not require registration or licence, but a post 1900ad flintlock muzzle-loading gun does require a licence and registration? No reply was forthcoming. Now we know why, there was no special advisory committee, it never happened. They will put $5 million into gun confiscation like the gun buy back scheme, but will not finance an advisory committee to make sure we have fair and sensible gun legislation. So I reiterate, just pretend that all we have are flintlock muzzle-loading guns, nothing else. The crime rate has soared, gun crime is on the increase. Do you think they will finally see the light and give us our breach-loaders back? Not a hope! Do you think they will leave firearms legislation alone and allow us to keep our muzzle-loading guns? I very much doubt it. Right now, because of the governments knee jerk reaction to firearms crimes, we are not allowed to answer the door with a firearm in our possession. We are not legally allowed to use a gun to protect our lives and the lives of our families unless we have already been shot! What does this say about a government? Does it sound like they care for our well being? Do they care about our safety? Do you think that our government considers that we have a right to protect ourselves and our family? If you think for one minute that our government cares about our safety and our right to pursue happiness, then you join the anti-gun brigade. But if you think that they only care about votes and making money, if you think you should have the right to defend yourself and your family, then you better start doing something right now. The only ones carrying knives, axes and guns on the streets right NOW, are criminals or people who fear for their own lives and are prepared to take the risk of imprisonment if they are caught. If I want to attend a Living History Rendezvous in Victoria, I have to apply for a special permit to transport my tomahawk! My wife had her multi-tool pocket knife which she used for preparing food when attending conferences away from home confiscated by police! We are not allowed to carry an ordinary single bladed pocket knife in NSW! I fully realise that voting for our rights to own a gun usually means voting against other preferences such as the environment, but we can only win one battle at a time. Right now we are losing on both fronts, firearms and the environment, so let's put all our efforts into one thing at a time. We need to legally have a right to defend ourselves, at the very least in our own homes. We need gun licence fees to be reduced, they are far too expensive. Flintlock muzzle-loading firearms need to be available off licence, no registration requirements and no special permit to acquire ( we are talking muzzle-loading here, a gun that needs a piece of rock to make it work! Give me a break!). We need assurance that we can keep the guns that we presently own legally, no more firearms legislation aimed at making it hard for law abiding citizens to own guns. Now if you think this post makes sense, then post the link around. Write a post on what you think is fair and just firearms legislation. But be realistic, be fair. There is a real problem with crimes involving firearms. We do not want to make it worse for ourselves by going off half cocked like the government. We need to give it some thought, we just want a fair go. All this evidence, and still the Australian Government can't come up with fair and decent gun legislation. 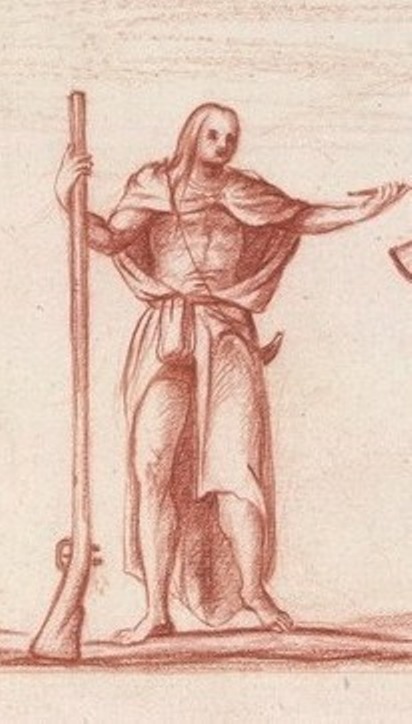 Eastern Woodland Indian Use Of The Fire Bow. Not much information to be found, certainly not primary documentation. Barry Rivera demonstrates how to make fire with a stick and a bow during a program on Woodland Indian culture and history. 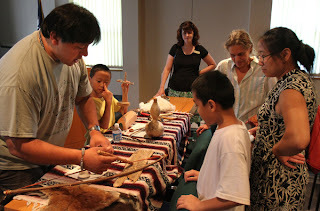 Primitive and Period Living Skills. Our group members are presently evaluating their skills. When I posted the list of skills I personally would expect one of our woodsrunners to have, I also asked if anyone could add to that list. What has arisen from that discussion is the question of "would everyone have had that skill". In this particular case the question referred to leather work skills. This was my reply. I think that if an item was needed, then the person needing that item would do his best to acquire it. If he/she could not purchase the item, then they would have to make it if possible. I have seen some rough leather work and some good leather work. Not everyone was good at everything. I am fair at making leather items with just the basic tools, awl, knife & needle. This is all the tools that one could expect the average person to be carrying or owning. I think we should make the best we can with these basic tools, & if it does not look good, but is functional, then that is the way it is and was. The more we do, the better we get, up to a point. There is the "that will do" attitude, which is mostly mine, and there is the "not good enough" attitude which involves more time to make something look its best. Our individual levels of skill are such that someone's "that will do" or "good enough" may well be better than the "not good enough" attitude, but in the end all that matters is that the item is functional. That is the skill level you need. So many skills are involved in putting your 18th century gear together. 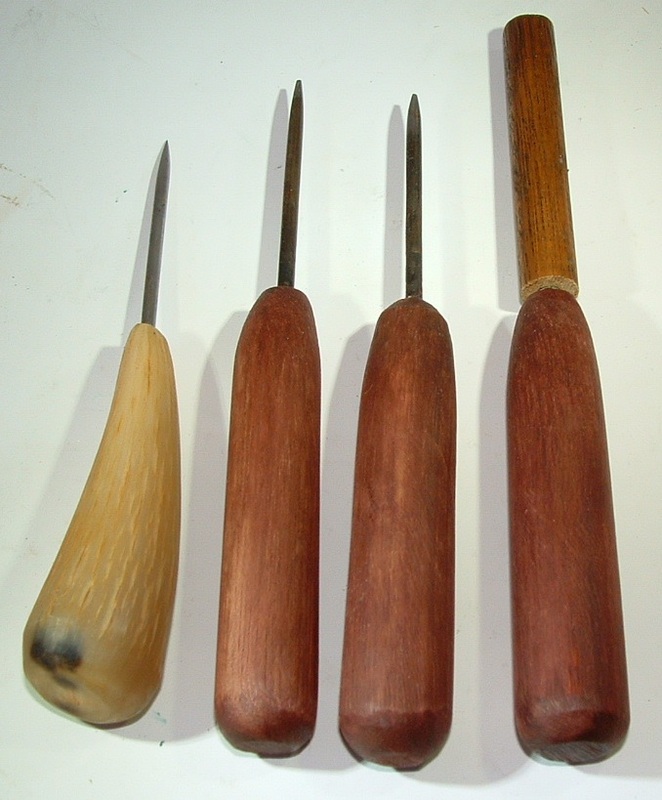 Before you can do any leather work, you need to make an awl. The top one I made, the lower one was my Father's awl. 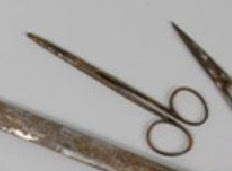 On the left is an awl which belonged to a close friend. He also made the three trade awls on the right. 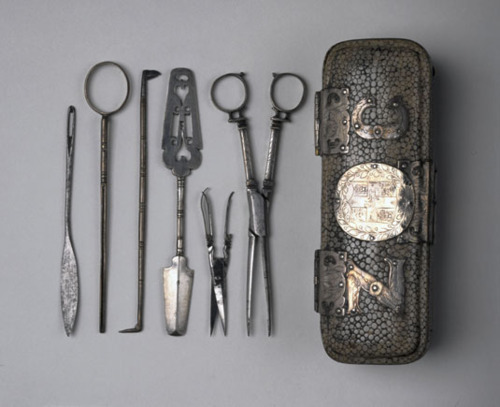 The "housewife" or sewing kit can come in various forms, but this one is the most popular type. 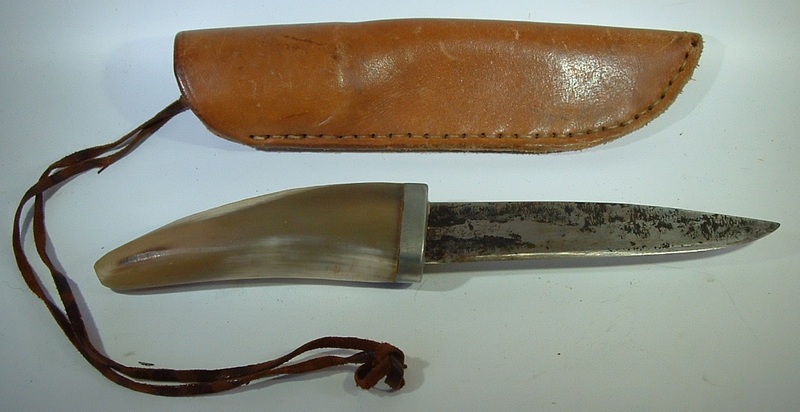 These lower three examples all have a double sheath. Softer leather cover over a hard leather sheath. This one above has an inner bark sheath. Various knife sheaths, all functional. YE shall understand, that the moste subtill and hardest craft in makyng your harneys, is for to make your hookes. For whose makyng ye must have feete toles thyn and sharpe and small beaten, a semy clam of yron, a bender, a payre of long and small tones, and an harde knyfe somedely thyke and an anuylde, and a lytle hamner. And for small fysshe, ye shall make your hookes of the smallest quarell nedilles that ye can fynde of stele, and in this wyse ye shall put the quarell in a read charcole fyre, tyll it be of the same coloure that the fyre is. Than take hym out and let hym kele, and ye shall fynde hym well allayed for to fyle. Than rayse the barbe with your knyfe, and make the poynt sharpe. Than alay him agayne or els he will breake in the bendyng. Than bende hym lyke to the bende accordyng to the purpose. And greater hookes ye shall make in the same wyse of great nedles, as broderers nedelles, or taylers, or shoomakers nedles, spere pointes of shoomakers nailes, in especiall the best for greate fysshe, and loke that they bend at the poynt wha[n] they ben assayed, for els they be not good. whan the hoke is bended bete the hinder ende abrode, and fyle it smothe for fretting of the lyne. Than put it into the fyre agayne, & geue it an easy read heate. Than sodonly quenche it in water, and it wyll be harde and strong. And for to haue knowledge in your instruments: loe they be here in figure portrayed. Hamer, Knyfe Pynsops, Clame, Wedge, Fyle, Wrest, & Inuelde. A treatyse of fysshynge wyth an Angle. I heat my stock to a bright red and flatten one end on the anvil. When it cools I shape the barb with a file and then shape the point of the hook with a file. that the line is tied to. Then I heat again and bend the hook into the stock. The stock I use is fencing wire. I secure my hooks in a piece of leather. I have not made any flies yet. What I got for Xmas, and Fly Fishing. A friend came out on Sunday & gave me some instruction on 21st century fly fishing. A lot harder than 18th century fly fishing. This modern fly fishing line is far longer than an 18th century fly fishing line and the method used to cast this modern line needs far more skill and coordination. My friend Deer Slayer also showed me a pair of forceps that he uses to work on flies, and to remove hooks from the fish. I had been wanting some forceps for ages for suturing, just in case I should need them. Now I had a double purpose for getting some. Before thou do land a large wel grown Trout. First on the stream, for that's all in all. But the chief point of all is the cookery". "There is no better sport then whipping for Bleaks in a boat in a Summers 206evening, with a hazle top about five or six foot long, and a line twice the length of the Rod". Fishing from the bank requires a long rod and a long line, but not as longer line as used these days. 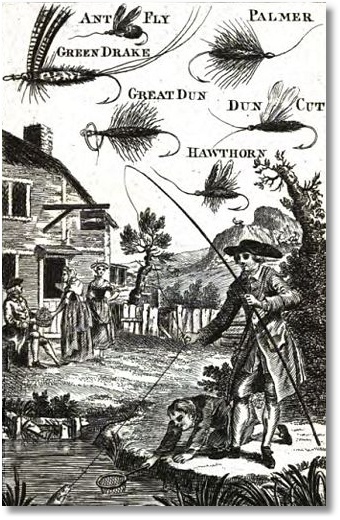 "Let your rod be light, and very gentle, I think the best are of two pieces; the line should not exceed (especially for three or four links towards the hook) I say, not exceed three or four haires; but if you can attain to Angle with one haire; you will have more rises, and catch more fish. Now you must bee sure not to cumber yourselfe with too long a Line, as most do: and before you begin to angle, cast to have the wind on your back, and the Sun (if it shines) to be before you, and to fish down the streame, and carry the point or tip of the Rod downeward; by which meanes the shadow of yourselfe, and Rod too will be the least offensive to the Fish, for the sight of any shadow amazes the fish, and spoiles your sport, of which you must take a great care". RECREATION. By ISAAK WALTON. 1653. 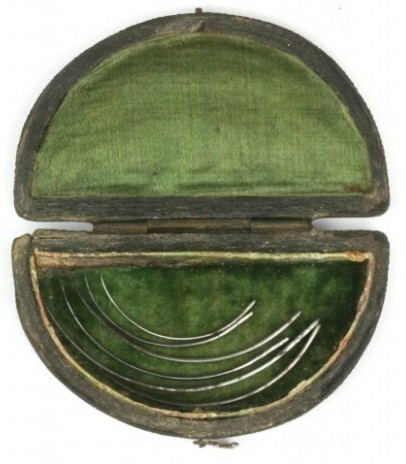 18th century case of suturing needles. Just like the modern ones I carry in my medical pouch. Grey Wolf also sent me this excellent kettle hook which he made himself. Thank you my Friends, Deer Slayer and Grey Wolf. Very much appreciated. A Merry Xmas to You All. I am not a christian, and xmas here in summer is no xmas at all for us. 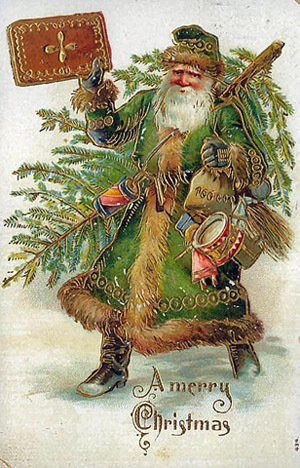 But I wish all of you the very best at this time of year, regardless of faith or creed. Indian Version of a Coat using a blanket. 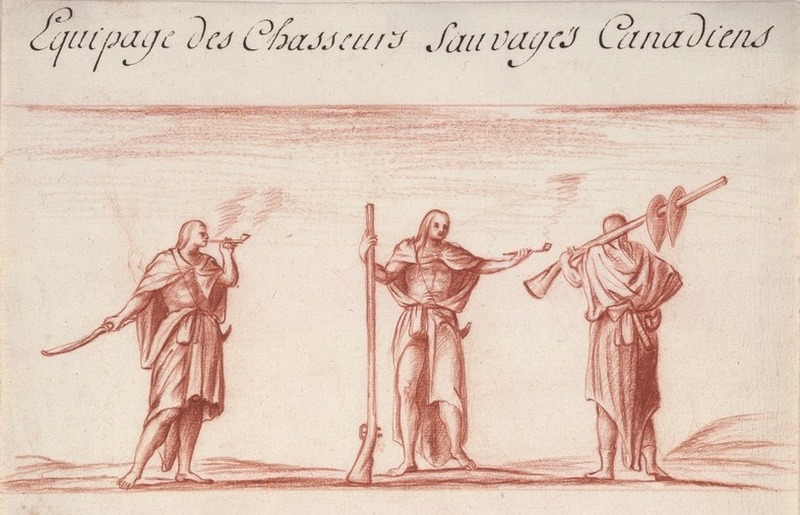 Equipage des Chasseurs Sauvages Canadiens, no. 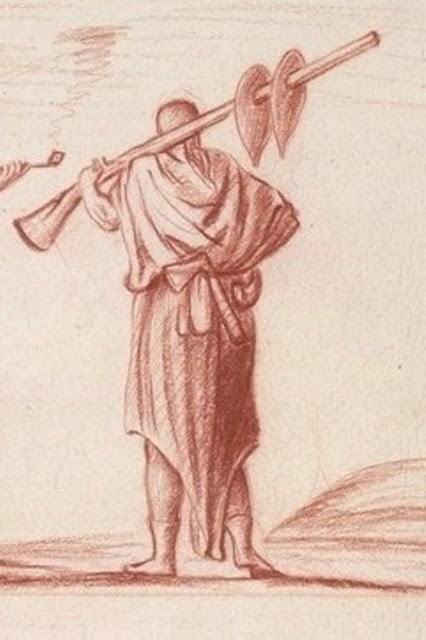 1-Circa 1730ad. Can you see the split pouch at the waist. I would say that this is being used as a shot pouch, Powder horn is at his left side. Notice the hood that is formed at the back. Blue was the favored color. 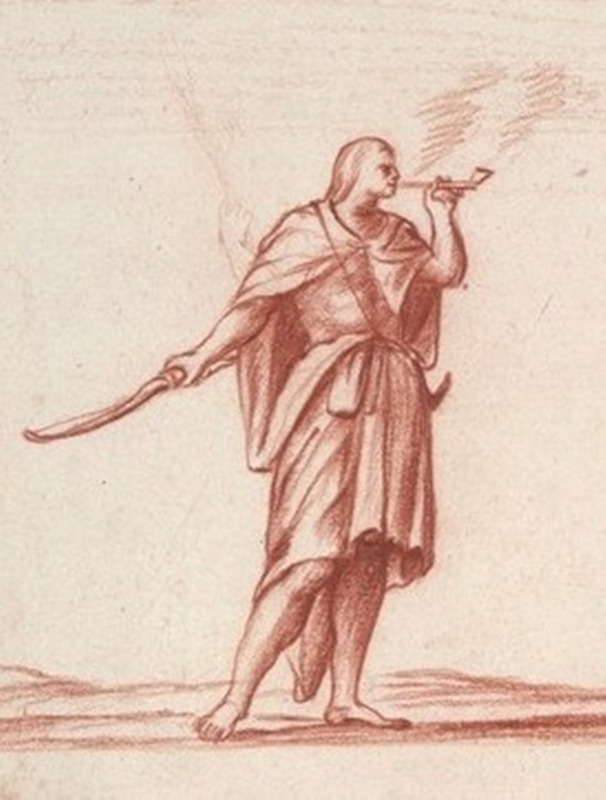 Like most textiles, capots rapidly became highly sought-after trade goods in New France. Native North Americans soon adopted the design to make their own garments from square-cut blankets, creating a kind of knee-length hooded cloak held together at the waist by a sash and closed at the chest with a clasp or pin. My sincere thanks to my Friend Gilbert Desmarais for supplying this image. DuPlessis 1690-1725. 1700ad Painting shows Capot. Blanket Coats, Blankets and Matchcoats. Please watch this short video and act upon it. Good Tomahawk/Trade Axe Research Site. A Link. Could lose my antique guns. Their Ignorance! About New France, Old England. Lavender For The Medical Bag. More on Cartridge Boxes and Cartridges. French and Indian War Cartridge Box. 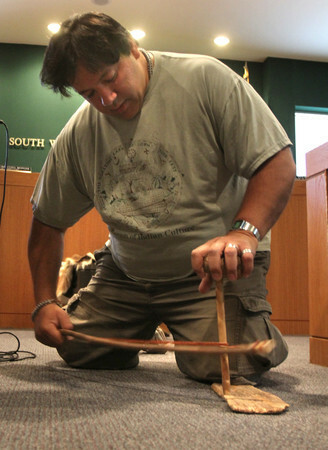 Tools of the Trade: Making Sails - A Link. More on Packs, Bags, and Equipment. LIFE IN PORTUGAL AT LATE 18TH CENTURY . A Link. Hunting Flying Foxes with a Boomerang. The 18th Century Baker. Links.